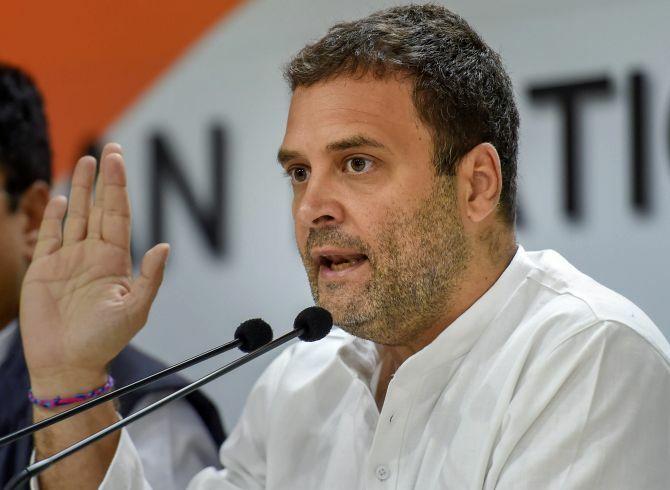 Describing demonetisation as a “tragedy” that destroyed millions of lives, Congress chief Rahul Gandhi on Thursday alleged that the government’s move was a carefully planned “criminal financial scam” whose full truth is yet to be revealed. On the second anniversary of note ban, he also alleged that demonetisation was a planned “brutal conspiracy” and a “shrewd scheme” to convert the black money of Prime Minister Narendra Modi’s “suit-booted friends”. “India will discover, no matter how the government tries to hide it, that demonetisation wasn’t just an ill-conceived and poorly executed economic policy with ‘innocent intent’, but a carefully planned, criminal financial scam,” Gandhi said in a statement. “The full truth about demonetisation is not out yet. India’s people will not rest till it is,” he said. In his statement, Gandhi said on the second anniversary of the prime minister’s “monumental blunder, the government’s spin-doctors, including our incompetent finance minister, have the unenviable task of defending an indefensible, criminal policy”. “Demonetisation was a tragedy. India has faced many tragedies in its past. Many a time have envious, external enemies tried to hurt us. But demonetisation is unique in the history of our tragedies because it was a self-inflicted, suicidal attack that destroyed millions of lives and ruined thousands of India’s small businesses,” he alleged. Modi’s demonetisation cost India over one and a half million jobs and wiped out at least 1 per cent from India’s GDP, Gandhi alleged. November 8th will forever go down in the history of India, as a day of infamy. Two years ago, on this day, Prime Minister Modi unleashed the tyranny of demonetisation on the nation. “At eight that night, he appeared on television to deliver a unilateral announcement, that we now know didn’t even have the support of his own economic advisors. With that one declaration of demonetisation, Mr Modi took 86% of India’s currency out of circulation, bringing our economy to a grinding halt,” he said. Former prime minister Manmohan Singh said on the decision’s second anniversary on Thursday that the havoc it unleashed on the economy and society is now evident. It is often said time is a great healer but unfortunately in the case of demonetisation, the scars and wounds of demonetisation are only getting more visible with time, Singh said. The Congress, too, criticised the Prime Minister Narendra Modi-led Centre’s move by calling it a ‘black day’ for Indian democracy and economy. Since then, various opposition leaders have highly criticised the Centre’s move, while the members of the Bharatiya Janata Party and its allies have backed the decision.